Press release from MapAction………….Good luck to Ming for his run! Prince Harry has invited disaster mapping charity MapAction to fly the flag for volunteering in the Olympic Torch Relay as it passes Buckingham Palace on 26 July, the day before the opening ceremony for the London 2012 Olympic Games. The Olympic Torch relay organisers asked Prince Harry to choose a torchbearer from one of his charities to take part in the relay at Buckingham Palace. Wai-Ming Lee (known as Ming), an active MapAction volunteer, has been given the honour of carrying the Olympic torch, where it will be viewed by Prince Harry and the Duke and Duchess of Cambridge. Ming was chosen to represent MapAction’s team of skilled volunteers, who fly to disaster zones to provide mapped information that guides life-saving aid to people in need: communities cut off by flood water, or even individuals still trapped in collapsed buildings. Ming first joined the charity in 2004 and deployed to such humanitarian emergencies as the Indian Ocean (“Boxing Day”) tsunami in 2004 and Pakistan floods of 2010. When he’s not flying out to disaster zones, he helps the charity develop its technical capabilities, so its operations are as streamlined and effective as possible. MapAction has already deployed to six humanitarian crises in 2012, in Africa, Asia and South America, and is ready to help wherever and whenever its emergency mapping service is needed. The torch is scheduled to arrive at Buckingham Palace at 18:38 hrs. Sponsored links are now back on this site – after some issues with the wordpress plugin I’m using. Please take a look at the links and click any which might interest you. 50% of any money earned will be donated to MapAction. 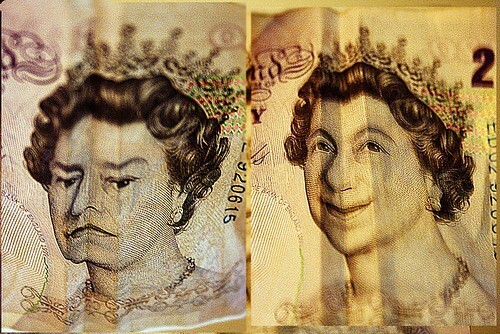 The other 50% will help me host and maintain web-gis.co.uk. Some time ago several articles about ShareMap.org were published on many important GIS related blogs and sites. Now ShareMap is slowly phasing out from beta stage. Feature set is almost complete and dozens of maps created with ShareMap enriches multiple Wikipedia articles . 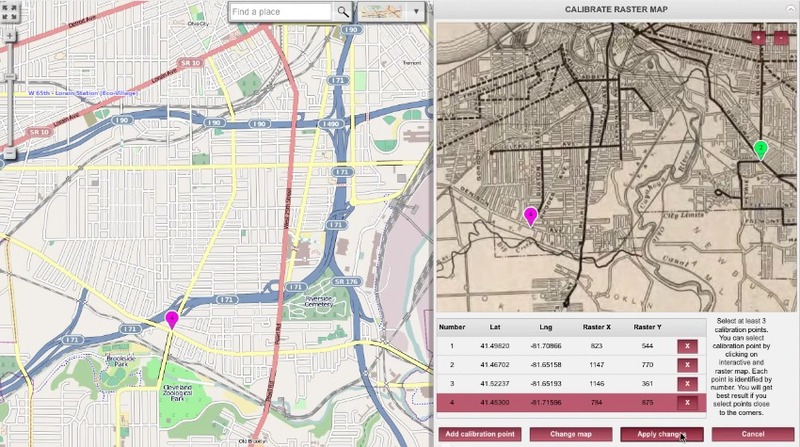 OpenStreetMap is enormous source for geospatial data. Implantation of import mechanism from OSM was one of first features of ShareMap. But sometimes OSM data is not enough, especially when we try to create historical map. For example if we want to create map of dismantled tramway system in Cleveland we cannot find information about track position at OSM. But we can reuse pre war map of system (with expired copyrights, so it is 100% comply with Creative Commons license). We can treat this old map as overlay to our interactive map, but first of all we have to calibrate it. In simple words calibration is just selecting of several calibration points on raster map (old one) and interactive map. After point selection the system warps. The well known open source GDAL library is used. In this video map calibration process is described in detail . Maps are not only latitude longitude and altitude of points. There is one more important factor – time. Some geospatial features exists only for limited timespan. Railway line to Ballachulish in scotland was build in 1904 and demolished in 1966. For viewer is very useful to see dynamics of processes – changes of routes, borders, points etc. . This is a key factor for creation of good historical maps. From map creator perspective adding timeline to existing map is very easy. Editor has just to fill the timespan fields of object on the map. 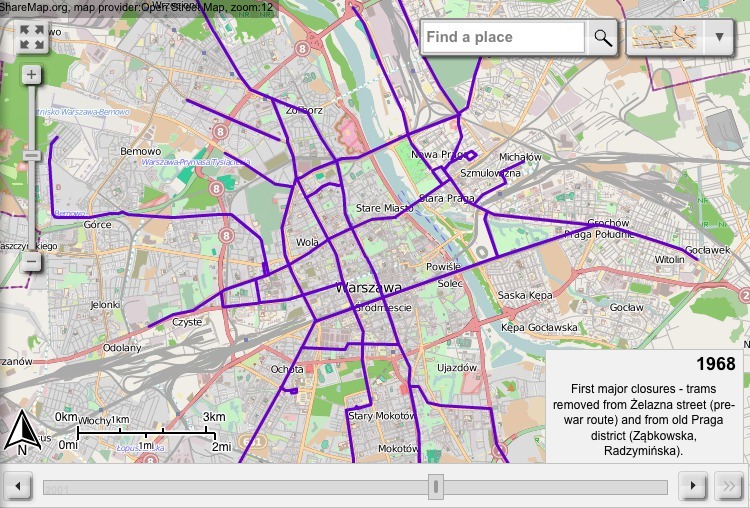 You can see example map (construction of tramways in Warsaw after WW II) here. . Screencast tutorial about animated map creation will be available soon. Now we are focused on improvement of existing features, fixing bugs and writing documentation. There are still some export features that are missing – animated SVG files, export to animated GIF’s , MP4 and YouTube. We are also working on mobile viewer for ShareMap maps. Old mobile alpha version is reworked and soon will be published for Android and iOS on app stores. I was recently involved in and helped set up the recent Interoperability Day 2012 (#interop12 on Twitter) at the Met Office in the UK. This was a joint event organised by the OGC and AGI. It was a great day and good to meet so many new faces and learn more about open standards and how they can work for different organisations. Thanks to all who spoke, sponsored and attended. I’m looking forward to the next geo event already!